The Historic Preservation Section provides for the identification, designation, and regulation of historic sites in Montgomery County. Our staff supports the Planning Board and the Historic Preservation Commission. We evaluate resources currently or potentially listed on the Locational Atlas and Index of Historic Sites for possible inclusion in the Master Plan for Historic Preservation. We analyze Historic Area Work Permit applications and evaluate proposed development plans to assess the impact on historic resources. In addition, we review Montgomery County historic preservation tax credit applications, administer the Historic Preservation Commission Grant Fund, educate the public and provide outreach to other organizations. State law recognizes that preserving historic resources throughout Maryland is a public goal and is in the public interest. In 1979, Montgomery County moved to establish permanent tools for protecting and preserving its historic and architectural heritage by adopting a Master Plan for Historic Preservation and enacting a Historic Preservation Ordinance (Chapter 24A of the Montgomery County Code). The Historic Preservation Ordinance created the Montgomery County Historic Preservation Commission (HPC). Its many duties include researching and evaluating historic resources and historic districts according to specified criteria and reviewing proposed exterior changes to sites and districts that have achieved historic status. The HPC’s nine members are appointed by the County Executive and confirmed by the County Council. Supporting the HPC are architectural historians and architects in M-NCPPC’s Historic Preservation Section. The HPC meets twice a month, usually on the second and fourth Wednesdays in the evening. HPC meetings are always open to the public. For information on specific meeting times and agendas, call the Historic Preservation Section at 301-563-3400 or look online. The Montgomery County Planning Board plays an integral role in the process of evaluating properties for historic designation. Each designation is an amendment to the County's Master Plan for Historic Preservation. Each amendment strives to respect and balance property owners’ goals and desires with the important public goal of preserving our shared heritage for future generations. In 1976, M-NCPPC surveyed the entire County and developed a list of properties that may have historic significance. This list was published as the Locational Atlas and Index of Historic Sites. Since 1979, the Historic Preservation Section has been systematically reviewing the Locational Atlas and undertaking detailed research on each resource and district that was flagged as potentially significant. The Historic Preservation Commission evaluates each resource or district to determine if it meets Historic Preservation Ordinance criteria for historical, cultural or architectural significance that would warrant its protection. A public hearing is held to get input from the property owner and the community about the historicity of each building considered for potential designation. The HPC then develops recommendations on historic designation that are forwarded to the Montgomery County Planning Board in the form of a Public Hearing (Preliminary) Draft Amendment to the Master Plan for Historic Preservation. The designation process for historic sites and districts then follows the regular procedures of all master plans and amendments (see A Resident’s Guide to the Land Use Master Plan Process in Montgomery County brochure). After the Planning Board, County Executive and County Council review (including public hearings before the Planning Board and County Council), a property is either placed on the Master Plan for Historic Preservation and protected by the Historic Preservation Ordinance or it is removed from the Locational Atlas. NOTE: The County Council makes the final decision on all designations. Because of the multiple opportunities for public participation in the designation process, this process can take many months. Owners and others may also nominate properties for historic designation that were not included on the original Locational Atlas. To do this, the nominator must provide the HPC with thorough, documented research on a completed Maryland Historical Trust Inventory Form. The HPC will evaluate this material and hold a public hearing so others may participate in the designation process. Call the Historic Preservation Section at 301-563-3400 for more information about nominating properties for designation. Once a resource or district is designated on the Locational Atlas or the Master Plan for Historic Preservation, the property owner must obtain a Historic Area Work Permit (HAWP) for any proposed changes to the exterior of structures or to the environmental setting of the site or district. This includes moving, demolishing or altering the exterior of a house, building or other structure listed on the Locational Atlas, the Master Plan for Historic Preservation or located in a listed historic district. Changes not seen from the street still require review. A HAWP is also required for new construction and grading and removing live trees greater than six inches in diameter. Some of the work for which you need a HAWP includes: constructing additions; removing or enclosing porches; installing siding, shingle or masonry facing or other changes to exterior materials; replacing a window sash with a new sash; permanently removing shutters; adding, removing or changing architectural features, including size, shape and placement of windows; painting or removing paint from masonry. Historically designated structures or sites are not frozen in time, and changes are regularly permitted. New construction in historic districts is allowed and need not be in a replicative historic style. In addition, historic designation does not require you to initiate any type of historic restoration. The HPC cannot require you to reinstall historic features if they were not there when you acquired the property or when the property was first designated as historic. For example, even if your home had a metal roof sometime in the past, you can replace an existing fiberglass shingle roof with a new one of the same material. You may paint your home any exterior or interior colors you desire as the HPC has no say in color selection and only regulates proposed changes to exterior features. Paving repairs with matching materials and performing general maintenance as long as the work does not alter exterior features. If you are not sure whether a project you are planning requires HPC approval, call the Historic Preservation Section at 301-563-3400 to help you preserve a part of our County’s history. In acting on HAWP applications, the HPC follows the requirements of the Historic Preservation Ordinance, any applicable guidelines that apply specifically to the historic district in question and the Standards for Rehabilitation issued by the U.S. Secretary of the Interior. If the HPC approves your HAWP application, the Montgomery County Department of Permitting Services (DPS), 255 Rockville Pike, Rockville, 240-777-6300, can issue your building permit. If the HPC denies your application, or sets conditions with which you do not agree, you can appeal the decision to the Board of Appeals, 100 Maryland Avenue, Rockville, 240-777-6600. In addition to the HAWP, other additional permits may be required from DPS. You can pick up a HAWP application when you apply for building permits at DPS and have the staff there explain the process to you. You can also find the application form and instructions online at www.mc-mncppc.org/historic. Throughout the HAWP application process, Historic Preservation Section staff is available to answer your questions. Several county, state and federal government tax benefits and loan programs can help offset the costs you might incur in preserving a property. County property tax credit of 10% of the documented expenses for approved exterior maintenance, restoration or preservation on structures designated on the Master Plan for Historic Preservation. Low interest loans for rehabilitation and restoration available through the Montgomery County Department of Housing and Community Affairs, 240-777-3600, if you meet income qualifications. 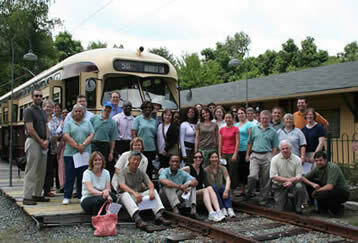 Historic Preservation Section staff, along with other employees from the Montgomery County Planning Department, at the National Capital Trolley Museum in Colesville, Maryland. Federal tax credit of 20% of the cost of a certified rehabilitation of income-producing properties listed in the National Register of Historic Places. The Historic Preservation Section educates residents about the historic preservation process and provides outreach to other organizations that celebrate and share our County’s rich history. These responsibilities include administration of the Historic Preservation Commission Grant Fund, production of the quarterly Preservationist newsletter, creation of educational brochures and coordination of annual heritage events within Montgomery County. M-NCPPC owns several historic sites that are currently open to the public (some with limited access), often through partnerships with non-profit groups. The Historic Preservation Section provides cultural interpretation of these resources in the County and communicates their history to the public.